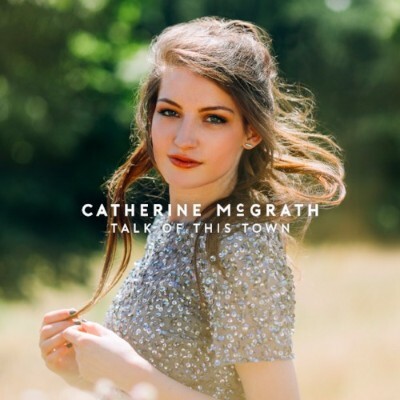 Having spent most of this year capturing the hearts of country and pop fans across the UK and Ireland with her blissful music and sensational live performances, rising star Catherine McGrath has released her brand new single ‘Talk Of This Town’, via Warner Bros. Records, which is her eighth consecutive New Music Friday playlisted track on Spotify. It is the first single to be taken from her forthcoming debut album, due in early 2018. 2017 has been an incredible year for the 20-year old with a string of amazing tour dates and critical acclaim for her two acoustic EPs enabling her to live out her wildest dreams. ‘Talk Of This Town’ was co-written with Rachel Clare Furner, Jeffrey Steele and award-winning producer Steve Robson (Rascal Flatts, Take That, One Direction) and is Catherine’s reflection on her remarkable journey so far. Since moving to London from Ireland and introducing herself to the country-pop world with her debut EP One at the end of 2016, Catherine has quickly flourished into a superstar in the making, hotly tipped by the likes of Music Week and The Times. She has also been working with some of Nashville’s finest songwriters including Liz Rose (Taylor Swift) and Jimmy Robbins (Kelly Clarkson, Miranda Lambert). In June she released the follow up EP Starting From Now, which saw her featured as the face of Spotify’s ‘Very Nearly Nashville’ playlist and Apple Music’s ‘Artist Of The Week’ dubbing her “a new heiress to the Taylor throne” with further additions on multiple high profile playlists across various streaming platforms. The EP features the tracks ‘Starting From Now’, ‘When I’m Older’, ‘Just In Case’ and ‘Never Wanna Fall In Love’, all of which come with fun and innovative social-media inspired videos. Catherine has also taken the live circuit by storm. At the start of the year she joined some of her idols at Country 2 Country Festival at London’s 02 and has gone on to support the likes of The Shires and Picture This on huge tours across the UK and Ireland as well as igniting festival stages including The Great Escape, British Summer Time, Latitude, Longitude, Standon Calling, Wilderness and Boardmasters with a second stage headline slot at Harvest festival. She has also just been announced as the support act for US megastars Dan + Shay on their UK tour this autumn. Full dates below.